Opening a brand new early childhood school is a daunting challenge. Luckily for Goodwin College, Jenna Tenore is not just up to the task, but has done it before. Tenore – an educator with years of experience both in the classroom and as an administrator – was recently hired as the director of the Goodwin College Early Childhood Magnet School, which will open in late August. Goodwin’s latest education initiative will serve 240 children ages 3 to 5 in a unique, supportive setting built with best practices in mind. Jenna Tenore is the new Director of the Goodwin College Early Childhood Magnet School. As an interdistrict magnet school, GCECMS will draw students from throughout the Capital region to learn on the Goodwin College campus. Construction is complete on the new school, located just across the street from Riverside Drive on neighboring Willowbrook Road. College administrators are very excited to see what Tenore will bring in her new role. 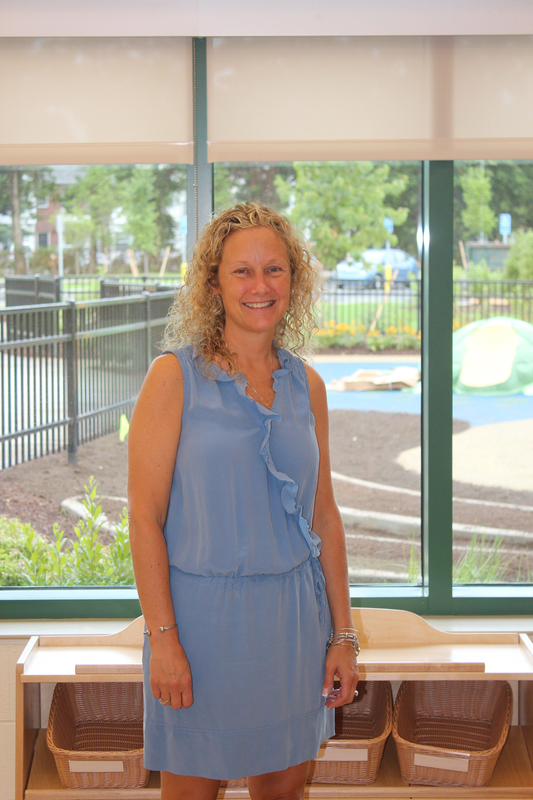 Prior to her new role, Tenore was principal of the Wintonbury Early Childhood Magnet School in Bloomfield. She worked with the teachers to create a learning environment centered on children’s learning needs, where students were encouraged to explore their creativity. Wintonbury became recognized as one of the best early childhood schools in the state and Tenore is eager to replicate the success at Goodwin. Beyond the challenge of developing the new school, Tenore was drawn to GCECMS as a homecoming of sorts. She spent 18 years as a classroom teacher at Willowbrook School in a building that stands right next to Goodwin’s new facility. “I am excited to be back in East Hartford,” she says. The school will follow the Reggio Emilia model, a concept that values flexibility of curriculum and allows children to express themselves. Teachers serve to nurture the curiosities of their pupils and children are encouraged to learn though listening, touching, moving, and seeing. Children are encouraged to build strong relationships with their classmates and adults. Families are welcome to join in and be at the center of their children’s learning. Also appealing for her was the relationship with Goodwin College and LEARN, the educational service center that is partnered with the institution. GCECMS is Goodwin’s second magnet school and first early childhood center. Tenore says the College has given her a good level of autonomy, and the faculty of Goodwin’s Early Childhood Education and Child Study baccalaureate degree program has proven a great sounding board for sharing ideas. Students from the College’s programs will play an integral part in the school. In addition to having a certified teacher and an assistant in every classroom, Goodwin students will observe and take part in learning activities. As a result, they explore their own understanding of child development and learn from the children with whom they interact. One of Goodwin’s proudest and most emotional traditions was held anew on Thursday, August 15, when 57 people made the transition from nursing students to graduates of the Associate Degree program. 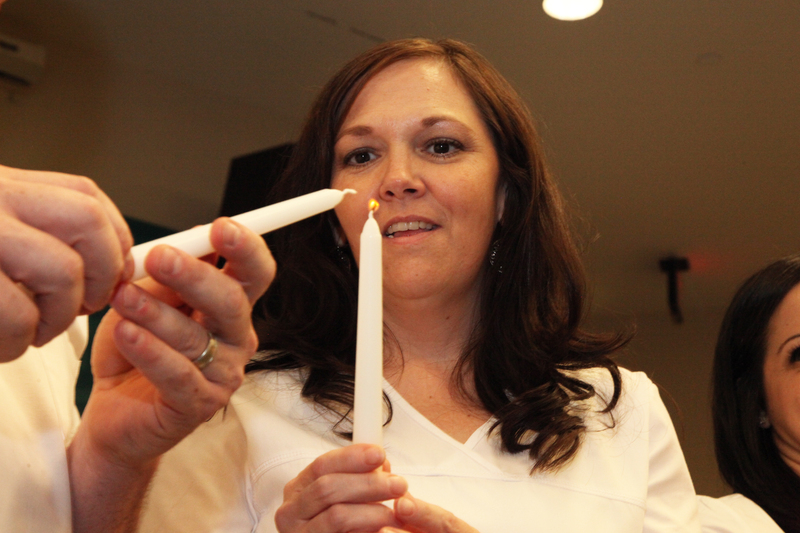 Michelle Garcia, newly pinned as a graduate of the Nursing program, lights her candle before reciting her oath. Photos courtesy of Muldoon Photography. The ceremony marked the 25th cohort of students to complete the program. It was held in the Goodwin College Auditorium with hundreds of family members and friends in attendance. Costello urged the students to “keep the fire in their bellies” as they continue with their careers or continue on to seek their baccalaureate degrees in Nursing. The College holds pinning ceremonies three times a year, celebrating each nursing cohort that completes the rigorous and intensive program. In addition to considerable time in the classroom, nursing students must complete clinical assignments and maintain solid grades in order to graduate. As a result, classes of students form tight bonds with each other. Pinning ceremonies are especially tender affairs where the students get to celebrate their success and give their thanks to the family members who supported them throughout the process. 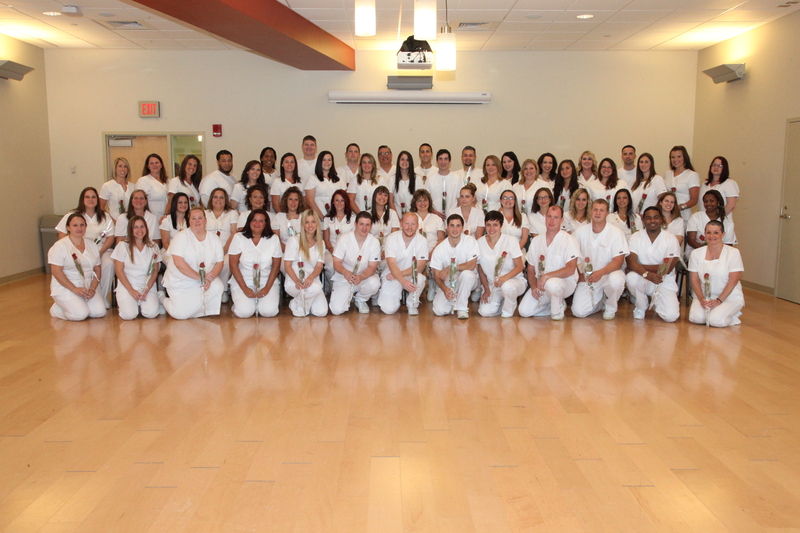 The 57 members of Goodwin College’s 25th Nursing cohort. Goodwin President Mark Scheinberg told the grads that he felt like a “proud papa” as he beheld the graduating class. Students come to Goodwin not just to prepare for a job, Scheinberg continued, but to prepare for the journey that awaits them following graduation. “This is the time that you begin to build your own reputations and your own practices,” Scheinberg said. Following tradition, the graduates all wore white and carried red roses into the ceremony. Upon being individually called, Costello placed a small pin on their lapels, signifying that their time as students had ended and that they were ready to move forward. Following the pinning, the lights in the Goodwin Auditorium were dimmed and the grads lit candles in the fashion of nursing pioneer Florence Nightingale, remembered as the “Lady with the Lamp.” The cohort members then read their vows by candlelight. Dating from 2004, the Goodwin Associate Degree in Nursing Program has produced thousands of qualified and compassionate nurses who have made a tremendous difference in the lives of their patients. With a steady drum beat and synchronic strokes of their oars, the students and staff members of the College’s dragon boat team competed well on Saturday, August 17. Goodwin’s Dragon Boat team keeps a steady rhythm in its first heat. Photos courtesy of Marilyn Nowlan. Goodwin filled a full boat of rowers to compete in the Dragon Boat and Asian Festival, held on the Connecticut River waterfront in Hartford. A full day of racing left the team tired yet accomplished as the Navigators performed very well in each of its heats. 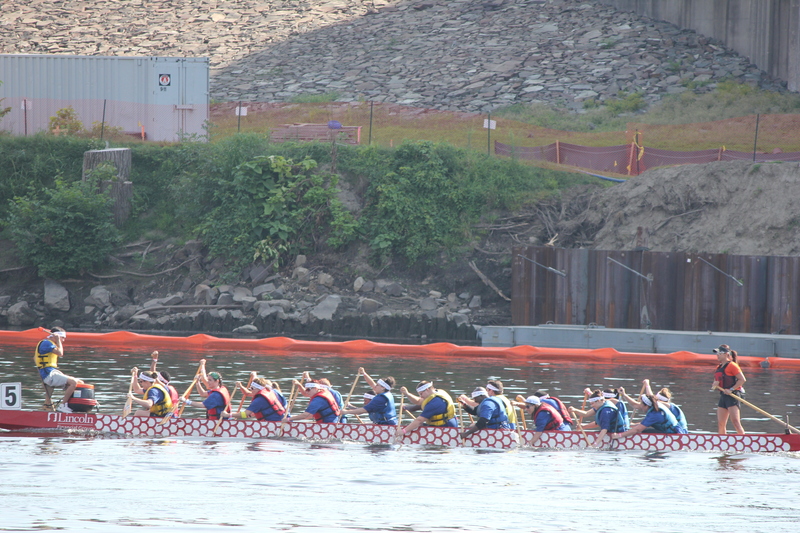 Goodwin College is a supporter of Riverfront Recapture, the organization which holds the annual Dragon Boat races. This year, 3,000 athletes comprised a total of 93 teams, including about two dozen people representing Goodwin. Goodwin teammates Erin Clark and Sarah Burgess smile after completing the first race of the day. Donning blue jerseys with a dragon emblem emblazed on the front, the Navigators raced against other organizations from throughout the Greater Hartford region. The team practiced on the Connecticut River in preparation for the race, run along a 500-meter course that ended near the Connecticut Science Center. Goodwin’s best result came in its third heat, finishing third. Emet, who captained the team, predicted that the Navigators will shave off about 10 seconds from its best time when the team competes again in 2014. 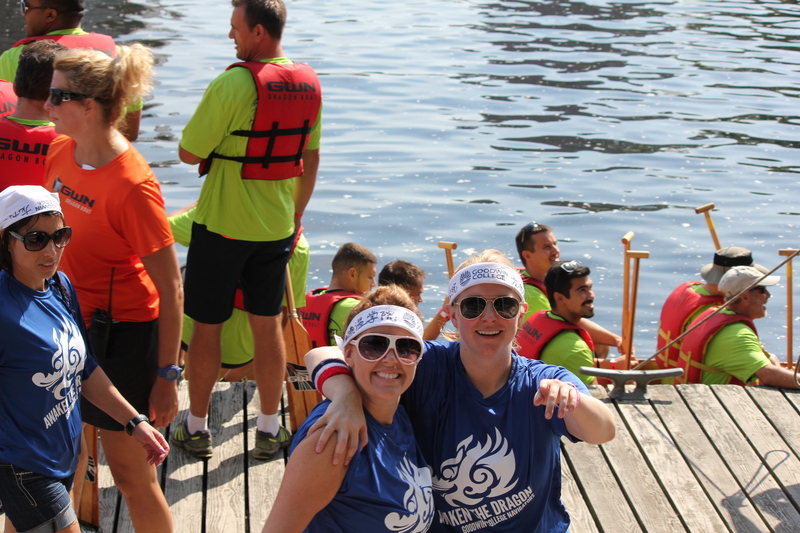 Dragon boat racing is one of the fastest-growing sports in the world. Originating in China, the sport has gone global, with festivals and races drawing thousands of competitors and spectators alike. Boats are designed in the image of a dragon and a drummer sits at the front, beating a steady rhythm to keep rowers in synch with each other. Check out photos of Goodwin’s team and other images from the Asian Festival in our Flickr album. Before attending Goodwin College’s Summer Bridge Academy and enrolling in a course on manufacturing, student Asa Strambler admitted to not knowing much about the discipline beyond how to use a screwdriver. 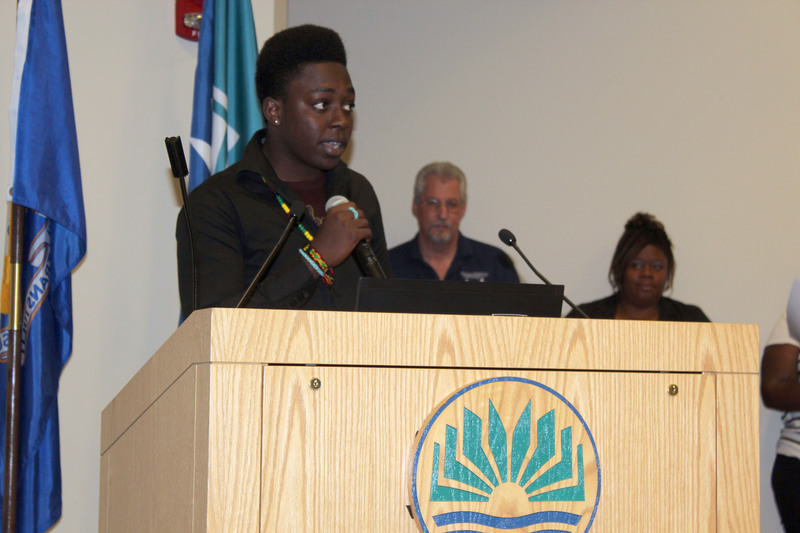 Asa Strambler, 2013 Summer Bridge Academy graduate, shares his experience. Six weeks later, Strambler stood before his fellow graduates in the Goodwin College Auditorium, describing what he saw as a great opportunity. “This manufacturing program has given me the ability to visualize myself having a successful career,” said Strambler, who will enroll in the Goodwin College Manufacturing Program in the fall. On Thursday, August 8, Strambler was one of 67 students to graduate from Goodwin’s Summer Bridge Academy. The program is designed to help recent high school graduates gain the skills they need to succeed at the next level, bridging the gap between high school and college. For six weeks, the students took courses at Goodwin taught by College faculty, in subjects including music, interpersonal communication, math, English, and manufacturing. The program is offered free of charge to participants. The curriculum is demanding, but the students may earn transferable college credits to get a head start in higher education. “The students before you certainly have a huge advantage entering the fall,” said Sandy Wirth, Goodwin College Dean of Students and Assistant Vice President, during the ceremony. The majority of the Summer Bridge grads will enroll at Goodwin, where the number of courses available to them – as well as their responsibilities to keep up and achieve – will increase. Tyesha Wood, Goodwin’s Transition and First Year Coordinator who organizes Summer Bridge, congratulated the students on their accomplishments and praised the mentors who volunteered for the program. Many of the mentors were past Summer Bridge graduates who see the importance of helping the next wave of students get acquainted with college. 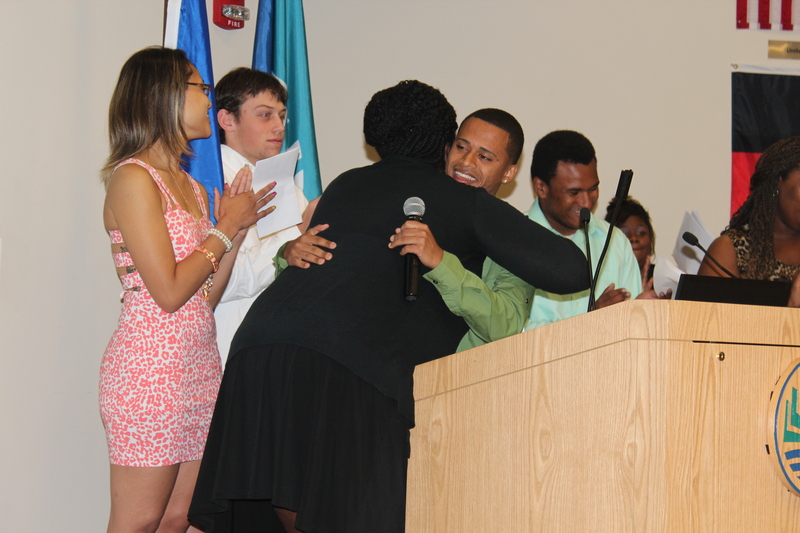 Dahian Rodriguez hugs Summer Bridge English Instructor Tanya Morehead-Cooley during the graduation ceremony. Some of the students and their instructors shared their experiences in Summer Bridge and how the program benefited them. Dahian Rodriguez, for example, read a tribute to English Instructor Tanya Morehead-Cooley, whom he credited with helping him to learn to better comprehend literature. Meanwhile, instructors recognized the dedication of the students to complete the program. English instructor Lisa Rodriguez commended one of her students, Mynor Rosales, who broke his ankle a few weeks into the summer. Faced with surgery to repair the break, Rosales refused to drop out of Summer Bridge, instead having his parents go to Goodwin to get the work he would need to complete in order to keep pace with his classmates. Tyrone Black, Goodwin’s Concurrent Enrollment Coordinator, gave the keynote address. Prior to speaking, he demonstrated the importance of personally connecting with people by going into the audience and shaking hands with each graduate, as well as a number of parents and other family members. Black told the students that he was greatly moved by their strength and stories. He told them that it was up to the graduates to fulfill their purpose, keep perspective, respond well to pressure, and to provide proof that they finish what they started. “Whatever you put out is what you receive back,” he said. 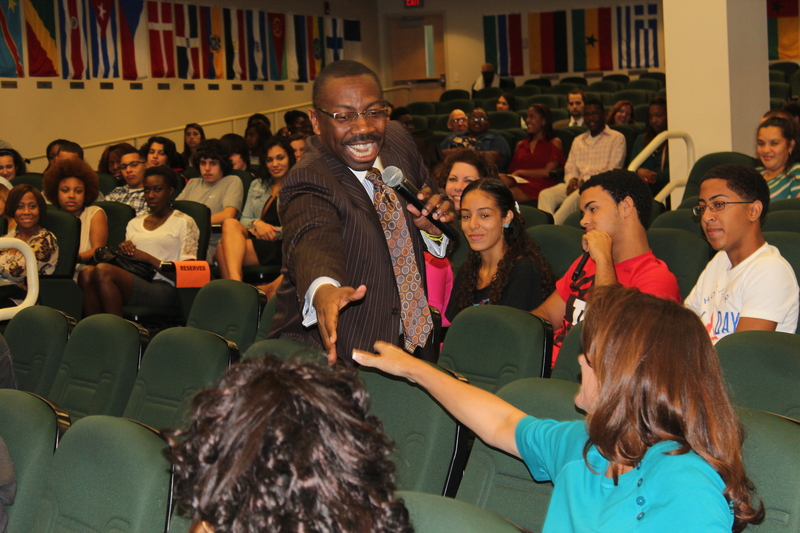 Tyrone Black, Goodwin College Concurrent Enrollment Coordinator, shakes hands with audience members. He continued by telling the grads that they would not face the next step alone, but rather with many people walking alongside them, helping them succeed. My name is Nick Lentino and I am the Assistant Vice President for Enrollment at Goodwin College. I wanted to reach out personally to discuss what Goodwin College can offer you. At Goodwin College, we know employment is one of the most important outcomes of a college education. That’s why we only offer in-demand, career-focused degrees which result in jobs after graduation. We welcome students to bring transfer credits from other schools to apply towards an education here at Goodwin. We know that your education is important to you, but that it may not be your only priority in life. That’s why we offer day, evening, weekend, on-ground, hybrid and online classes. To further accommodate our students we offer three semesters annually, both accelerated 7 1/2-week and standard 15-week courses, providing you with the capability to finish your degree at your own pace. Luckily, at Goodwin, you can pursue your degree regardless of your financial resources. Most students start classes with little or no out-of-pocket expense. Goodwin works directly with employers, giving students direct access to valuable internship and employment opportunities before and after graduation. We offer tutoring, counseling, mentorship, and a supportive classroom environment making it easier for you to succeed, regardless of the skills you have when you start. Please reach out to me personally so we can further discuss options for your future. Bill Nye the Science Guy would be very proud of the approach Goodwin College is taking to brownfield remediation. Scientists are taking a familiar chemistry concept and applying it in a revolutionary way to bolster the College’s efforts to clean up groundwater lying below the parking lot. The process, which involves treating petroleum contamination with hydrogen peroxide, is now being deployed on campus, with the intended result of cleaning discharge before it reaches the Connecticut River. Geo-Cleanse president James Wilson demonstrates the oxidation process. 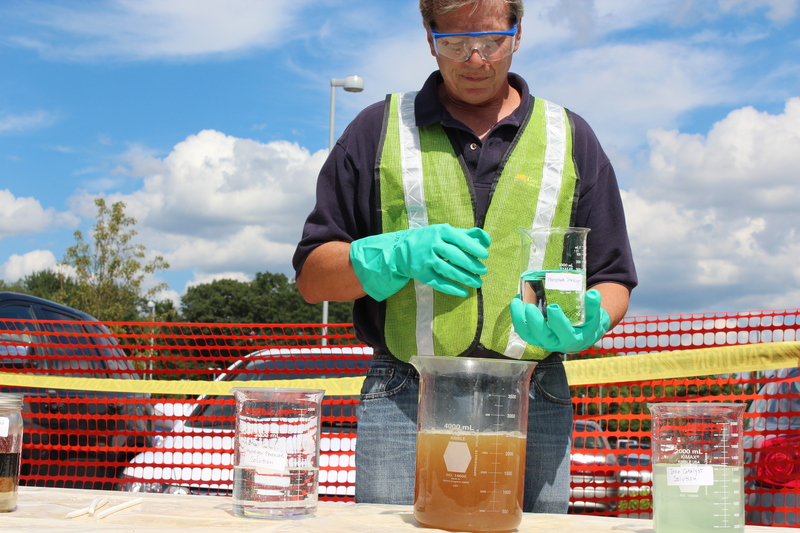 Geo-Cleanse, a New Jersey-based company, tested soil and prepared the site prior to beginning the process. On Tuesday, July 30, Geo-Cleanse joined Zuvic, Carr & Associates – Goodwin’s environmental engineering consultant – in demonstrating how the concept could benefit campus remediation efforts. Goodwin is in a unique location for such an effort to be conducted. For decades, Riverside Drive was heavily industrial, with countless fuel storage tanks lining the Connecticut River. Years of petroleum storage and spills left the area polluted and the soil and groundwater contaminated. Through grant partnerships with the Federal, State, and East Hartford government, Goodwin has worked diligently to remediate Riverside Drive and make it safe for redevelopment. The results have been exceptional, with the College opening its River Campus in 2009. According to Martha Lemmon of Zuvic, Carr & Associates, the property has been safe for redevelopment, with no risk to those who commute to and work at Goodwin. Still, there is additional remediation that needs to be done well below the surface, where groundwater remains contaminated. Over time, the groundwater moves toward the Connecticut River, where it discharges. The contaminant cleanup is evident from right to left, demonstrating the different stages of the process. river. Scientists have carefully tested soil and groundwater to identify what contaminants exist. Once the composition was determined, chemicals could be added to ground that would essentially turn the petroleum in the groundwater into water and carbon dioxide, which are easily removed. “We evaluate the technology on a site by site basis,” said Geo-Cleanse president James Wilson. To remove the contaminants, an oxidizer must be carefully combined with other chemicals to produce the desired reaction. “As long as you contact an oxidant with a contaminant, you will destroy the contaminant,” Wilson said. Wilson explained that the chemistry behind the process is not a new concept. What makes Goodwin’s remediation unique is the use of hydrogen peroxide as the oxidizing agent. The Connecticut Department of Energy and Environmental Protection granted Geo-Cleanse permission to apply the hydrogen peroxide, which has been used in other states on larger scale remediation projects. During the demonstration, Wilson played the role of chemistry teacher to explain the process. He applied a hydrogen peroxide solution to a phosphate, showing the same technology and chemical reaction that is taking place well below the Goodwin College parking lot. 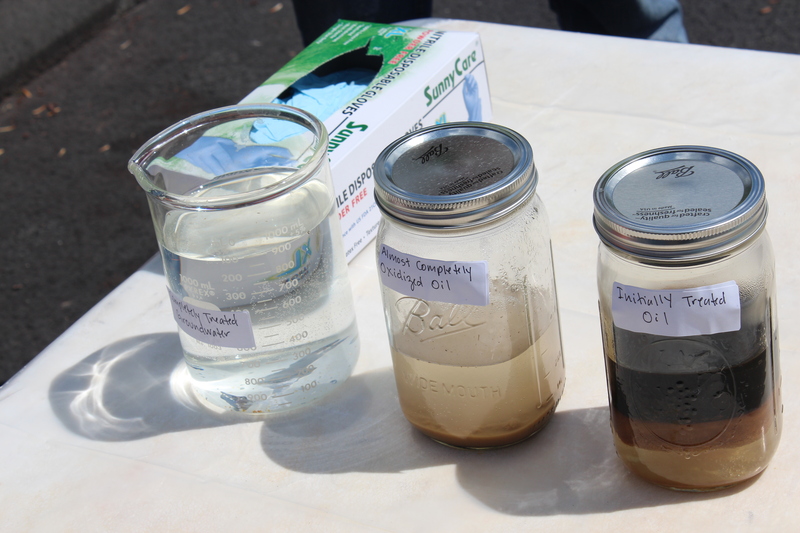 A sample of the contaminated water, shown pre- and post-treatment, demonstrated just how effective the peroxide is at cleaning the groundwater. A large crowd gathered to view the demonstration including students from Goodwin’s Environmental Science program. The chemical injection will continue through August 14, when the pilot study will end. Data will be used to determine the next step for Goodwin and whether the ISCO remediation will be applied on a larger area of the campus. EAST HARTFORD – Goodwin College has dedicated its 6th floor boardroom to Updike, Kelly & Spellacy, P.C., a major law firm that has represented the College through rapid growth. 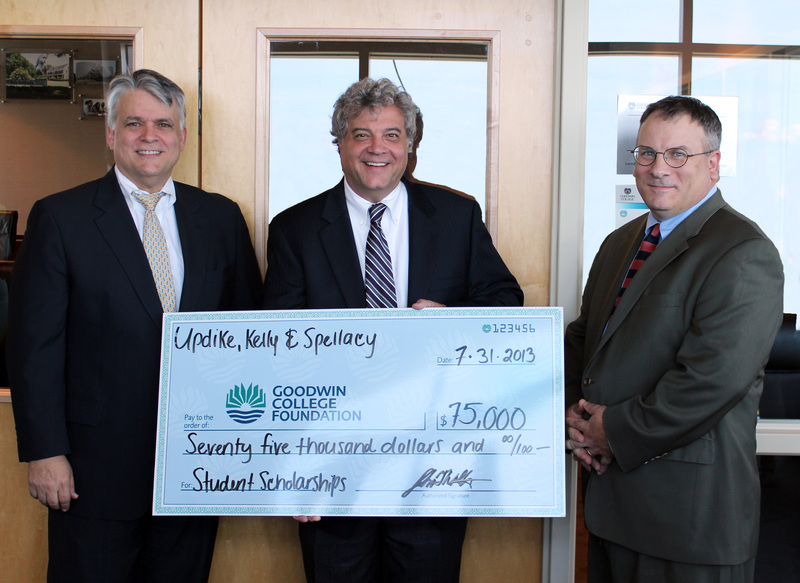 Updike, Kelly & Spellacy gave $75,000 to the Goodwin College Foundation. Pictured are Attorney Robert DeCrescenzo, Goodwin College President Mark Scheinberg, and John F. Wolter, President of the legal firm’s Hartford office. The dedication was made in recognition of a $75,000 gift to the Goodwin College Foundation, the College’s fundraising arm that provides scholarships and other opportunities to students. Several partners from the firm joined Goodwin College administrators to cut the ribbon. The dedication is fitting; for years, many key decisions and discussions between the College and the firm took place in that very boardroom. Robert DeCrescenzo, a principal attorney at the firm and former Mayor of East Hartford from 1993 to 1997, has worked with the College for years. Updike, Kelly & Spellacy has represented Goodwin College for a decade through dramatic change and expansion. Since the early 2000s, Goodwin has remediated brownfields on Riverside Drive, relocated to the new campus from a former site on Burnside Avenue in East Hartford, and has purchased dozens of properties throughout the town. The College has grown exponentially in the number of students, employees, and community influence; growth the firm was instrumental in making possible.